It was a strange letter written to the people of Grant County, and published in the Dubuque Telegraph-Herald on May 30, 1974. “We are incorporated and will be known as “THE POSSE COMITATUS OF GRANT COUNTY, WISCONSIN” it declared. “Our organization…stands for constitutional government and freedom. Our pledge is to assist public officials…but we also pledge to help EXPOSE those who violate the law and the U. S. Constitution.” To the average reader it must have seemed strange when the author, Earl S. Martens, operator of a salvage yard near Platteville said; “We believe the U. S. Constitution is the SUPREME LAW of the land (despite the traitors, who would like us to believe otherwise).” What was he talking about? Most readers probably did not know that this was the beginning of a drama that would continue to this day. Martens said that under the constitution the county sheriff is the only legal officer, because only he is elected. Federal and State officials had no legitimate right to engage in law enforcement, he believed. Martens threatened to make “citizens arrests”, if the sheriff refused, of those whom his group felt were committing “unlawful acts.” If the sheriff did not prosecute, they would form “citizen’s juries” to try their targets. Grant County Chief Deputy Sheriff Lloyd Runde advised Marten’s that under Wisconsin law Posse Comitatus members could not make arrests unless they were sworn deputy sheriffs. A radical group had begun its work in the county. This movement was not confined to Grant County alone. In the 1950’s a building contractor in Wichita, Kansas named Arthur Porth filed a claim with the IRS for the return of the income tax he had paid. He argued that the 16th amendment, ratified in 1913, which gave Congress the power to “lay and collect taxes on income”, was unconstitutional because it put citizens in a position of “involuntary servitude” to “international bankers” in violation of the 13th amendment. He also argued that since paper money was not backed by gold or silver, that taxpayers were not required to pay taxes because Federal Reserve notes were not dollars. He went about the country speaking and wrote a book called “A Manual for Those Who Think That They Must Pay an Income Tax.” He issued “arrest warrants” against officials who he decided were violating the Constitution. His beliefs and tactics formed a foundation for those who formed the Posse Comitatus. Porth’s ideas inspired William Potter Gale, who founded the Posse Comitatus and the “Christian Identity” movement in the late 1960’s. He and his followers believed white men were the pinnacle of God’s creation and that African Americans were subhuman “beasts of the field” who had no souls. They believed that Jews were servants of Satan who worked their evil deeds by controlling the banking system. They felt that the United Nations was a conspiracy to sell out the country to communists and Jewish bankers. These beliefs were more elaborate versions of the beliefs spread by the Ku Klux Klan in the 1920’s. The next surfacing of posse radicalism in Grant County was in 1975 when two individuals, Gordon Buttorff and Charles Dodge, Posse members using the front name "Little People's Tax Advisory Committee" began holding meetings attended mostly by Dubuque John Deere workers. Many of these were men from Grant County. Dodge and Buttorff preached the typical line; the income tax was unconstitutional, and there is no legal obligation to pay it. They coached the John Deere workers on methods of avoiding taxes, advising them to claim 20 or more exemptions on their W4 withholding forms so that no income taxes would be withheld. Fifteen followed their advice and they ended up in federal court, charged with tax evasion. All were convicted, and despite frivolous appeals (their arguments had been refuted again and again in the courts) and harassment suits that some of them filed against the judge and public officials, they went to jail and paid substantial fines and court costs. Some of these were members of the family of Leonard and Norma Ginter of Dickeyville, charter Posse Comitatus members. Another of those prosecuted was Bernard Hinderman, another early convert to the group. The fifteen tax evaders didn't help themselves by demanding representation by posse members who were not licensed to practice law. Robert E. Walsh Jr. refused a court appointed lawyer, saying he would not accept attorneys “from the ranks of our adversaries or from the Bar Association” They felt that licensed lawyers were lackeys of an unconstitutional federal and state government. Mark E. Mulvehill, one of the defendants said “we do not advocate cheating…We advocate payment of just taxes. We are not criminals.” The court decided they were. On May 13, 1975 they and their supporters, upon the conviction of Walsh, threw the federal courtroom in Cedar Rapids into “pandemonium”, requiring an increase in security. Twenty law enforcement officers had to be posted to keep order and do weapons checks. Dodge and Buttorff had promised to help if the government questioned the tax evasion scheme, but they refused when the feared federal prosecution became the fact. These instigators were themselves charged and convicted of aiding and abetting criminal tax evasion. Leonard Ginter was reported to have helped arrange the meetings with Buttorff and Dodge which led the Deere workers into the whole mess, with their talk of an oppressive government that levies taxes without authority, of the right to set up their own courts, their own units of government, and make citizens arrests of those elected and appointed officials who did not abide by the Posse Comitatus's notions of right and wrong. In 1975, the Posse Comitatus using as a front name “Grant County Taxpayers Alliance” also inspired a recall election against Grant County Board chairman Richard Markus. His sin was being a member of, and supporting the Southwest Wisconsin Regional Planning Commission. When the farm crisis of the 1980's came, these same men would call themselves "Family Farm Preservation" to try to lure hurting farm families into their web of political, religious, and racist ideologies. In the late 1970’s and early 1980’s there was desperation in farm country. The government, seeing expanding markets in communist countries, encouraged farmers to expand their operations. Many borrowed to buy equipment and land. Then interest rates exploded and many farmers, unable to make their payments, went bankrupt. Organizations like the Posse Comitatus saw an opening they could exploit. They spoke with rural groups, spreading a message that blamed international bankers and conspirators in government for putting them out of business. Some farmers joined the movement, most notably in Michigan and Wisconsin. They saw in the Posse’s conspiracy theories an answer to their questions. This explained, some believed, how this economic disaster had happened to them. Fringe groups prospered in Wisconsin. James Wickstrom, a tool salesman, angered at seeing African-Americans promoted above him, joined the Posse in Racine. Subsequently he teamed up with Donald Minniecheske, another Posse member who owned 750 acres of land on the Embarrass River near Tigerton, Wisconsin. They set up a compound and called it a “township” which they declared to be independent of Federal, State, or County jurisdiction. Wickstrom declared himself clerk and judge of the township. A defining event occurred on February 13, 1983. 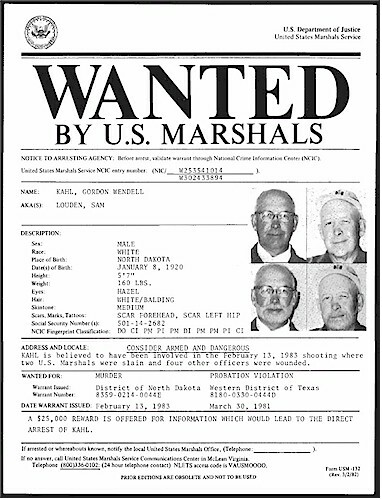 Gordon Kahl, a farmer and oil field mechanic who was a highly decorated decorated World War Two veteran, got into a gunfight with Federal agents sent to arrest him near Medina North Dakota. He had been imprisoned in 1979 for tax evasion, after stating on a radio program that he had no obligation to pay taxes and would not do so. Kahl lost his farm in 1981 for nonpayment of income taxes. He was wanted for violation of parole: he wrote a letter to the court refusing to appear when summoned, and vowed not to pay taxes. Gordon, his wife, and son Yori were intercepted at a roadblock near their home by U.S. Marshalls. Kahl and his son were armed with semi-automatic Ruger Mini-14 rifles. In the ensuing gunfight Yori Kahl was gravely injured and Marshalls Kenneth Muir and Bob Cheshire were killed. Kahl took the car of Medina deputy police Chief Steve Schnablel and fled to Arkansas. He stayed in several of his sympathizers homes, including the home of Leonard and Norma Ginter at Smithville, Arkansas. On June 3, 1983 the FBI received information indicating that Kahl was at the Ginter home, the concrete fortress. Eight thousand rounds of ammunition were reported stored in their home. Ginter was captured in his car leaving the home and Norma surrendered herself. Kahl died in the subsequent gun battle with the 28 lawmen present. Lawrence County Sheriff Gene Matthews was killed by Kahl. “Kahl was the catalyst that made everyone come forth and change the organizations from thinkers to doers” said James Ellison, leader of the Covenant, Sword, and Arm of the Lord (CSA) a successor group to the Posse Comitatus. To avenge Kahl’s death, the CSA had planned to use rockets to blow up the Murrah Building in Oklahoma City in 1983, years before Timothy McVeigh bombed it into rubble on April 19, 1995. Their plan never was put into action. The Ginters were charged with murder and harboring a fugitive. Under Arkansas law an accomplice could be charged as if he had committed the murder. These charter members of the Posse Comitatus of Grant County were tried in Arkansas. Leonard Ginter was sentenced in State Court to eight years in prison, and in the Federal Court to five years. Norma, who was born in Beetown, was sentenced to time served and placed on probation. It would be pleasant to say that this storm of hate and rebellion crested and died out, but it is still with us. Wickstrom was imprisoned for impersonating a public official and for counterfeiting. His “Family Farm Preservation” organization cynically sold phony currency for $200.00 a packet to desperate debtors telling them they could use the notes to pay off their debts. The “township” at Tigerton died out, but the poison of these beliefs has spread to dozens of other organizations and militia groups. One of these is the “Sovereign Citizens Movement”, which has grown rapidly in the last five years. They hold the same basic beliefs as the Posse Comitatus did. Once again they feed on hard times, and do not hesitate to become violent. In February 2010 Joe Stack, a member, flew his plane into the IRS building in Austin, Texas. In March 2012, this group sent letters to State Governors, including Governor Doyle demanding that they vacate their offices or “face removal.” This prompted a Department of Homeland Security Alert. Three weeks ago in Louisiana two sheriffs’ deputies were murdered and two others injured in an ambush in a trailer court. Sovereign Citizens members are suspected. And so the insanity continues. In 1983 a federal official who refused to be identified said “not every member and every chapter of the Posse has the same views as the Klan” Many of these individuals were not engaged in any criminal activity except tax evasion. The newspapers of the time do not tell us what the racial and religious views of most of the Grant County Posse members were. Bernard Hinderman of Grant County, one of the founders and promoters of Grant Counties fringe groups, is listed on a Department of Revenue site that names delinquent tax payers as owing the State of Wisconsin back taxes of over $210,000.00. What he deems himself not obligated to pay, the rest of us must. In 1995 Leonard Ginter reportedly spoke to a group of like minded people and said “"Go back to the time when somebody committed treason years ago, most of them were put on a scaffold to swing. That's what we need to do. If we do about 10 of them, the rest will straighten out. It wouldn't necessarily have to be a judge or a governor. If one governor got it, we wouldn't have any trouble with the rest." Since the 1960’s groups on the left and the right have challenged the legitimacy of our government. Why do some come to believe that they have the right to determine what is constitutional, and which laws they will obey? We live in a democracy. We all elect our leaders, not those on the fringes who feel they can arrogate unto themselves the rights of all. Now, even those we elect to run our government demean it, and sow the seeds of distrust in the very institutions they manage. They do it for political gain. This is the pattern for demagogues on both the left and the right. Is it any wonder that citizens feel bewildered? 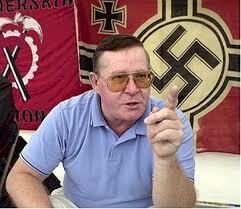 Some have accepted the deranged explanations and “solutions” offered by radical fringe groups. What does the future hold? I have enjoyed reading some of your historical sketches. I have referenced one of them in my blog entry for today. I hope you don't mind. Keep up the good writing!